The history of Echizen forged blades, produced in the Takefu area of Echizen, Fukui Prefecture began in 1337 when Kuniyasu Chiyozuru a master swordsmith from Kyoto came to the area seeking water suitable for metalworking processes and started making both swords and, for farmers, sickles. 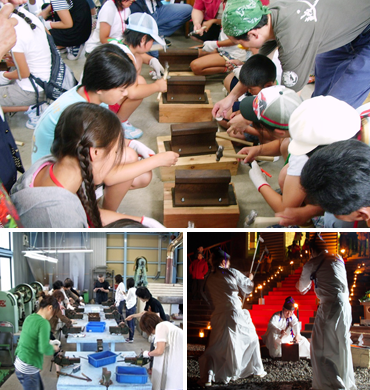 Local people who learned the techniques then started producing sickles, hatchets, and other bladed farming tools. These were sold all over Japan by peddlers and, by 1874, the town accounted for the largest share, 27.5%, of the sickles sold in Japan. In keeping with the needs of the day, the range of products had extended to kitchen knives, shears and other garden tools when, in 1979, in a first for first bladed tools in Japan, implements from Takefu were recognized by the nation as traditional craft items. As well as sustaining traditional techniques for making Echizen forged blades, Takefu Knife Village aims to create contemporary cutlery with superior design. Currently, knives made here are in demand all over the world, and Takefu brands are gaining global recognition. Echizen forged blades are hand wrought by beating heated steel with a hammer. In a traditional forging process known as mawashi kozuke, ferrite and steel are laminated and hammered into a diamond shaped blank, which yields a product that is light, tough, and has a superior edge. 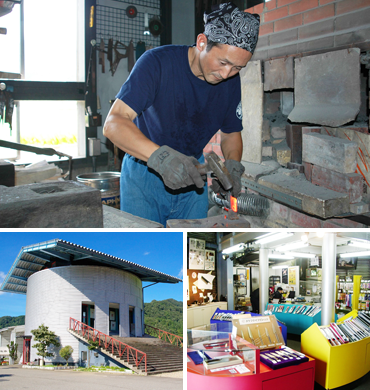 As well as being able to watch from the observation deck of the shared smithy in Takefu Knife Village, the production processes carried out by seven traditional smiths as they forge kitchen knives, you can try making your own paper knife or knife sharpening or others of the seven hands-on experiences on offer. From 0 hour on January 1, you can also see the amazing sight of smiths, dressed in black-lacquered headgear and white clothing, carrying out the “first forging,” an ancient rite to pray to stay safe during the year. 22-91 Yokawa-cho, Echizen, Fukui Pref.